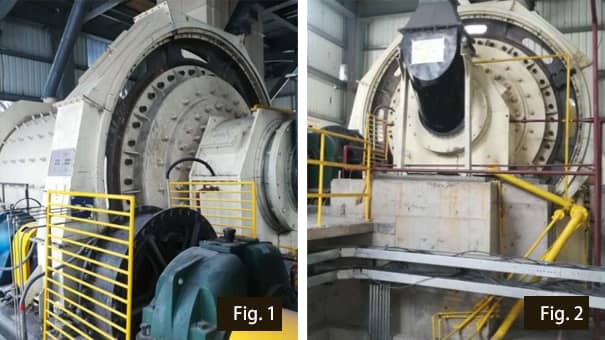 Two GMBZ2445 rod mills designed by Luoyang Dahua have been put into trial operation in Singapore recently, and the equipment runs well. The equipment is used for limestone processing and the terminal materials for desulfurization operations in power plants. The rod mill adopts sliding bearing support, feeding hopper and surrounding discharge. As shown in fig.1 and fig.2. The feeding particle size of limestone is below 10 mm, discharging granularity is respectively 1-3 mm, 1-200 mesh, and > 200 mesh. The main product is 1-200 mesh particles, which are used for desulfurization in power plant. At present, the ratio of briquetting is more than 50%, after the adjustment with rod loading and feeding amount, the yield and grain shape still can be improved, so as to create more economic benefits for the customer.